Outside of books and stationary, school bags are actually one the most important and aspects of a child’s school life More than just a means of carrying things around all day, a school bag is in fact but a cute style and fashion mark among the kids. It expresses and explains the personality of a child, especially in terms of his/her peer group. With that in mind, the seemingly humble school bag can be considered among the most important need and accessory for a child during their school-going years. If you are planning on buying any school bags for your little ones this year, then here are some helpful tips on how to find the best ones which will not only fulfil your child’s individual needs, but also their surprisingly style-conscious wants. The first thing that you need to consider as a parent before picking up new school bags for your kids is the actual amount of books and stationery that your child needs to carry every single day. For example, a child of Kindergarten or playschool-going age doesn’t need a huge bag, as they won’t have all that many books to bring there, while a child in 7th or 8th grade (or secondary school-going age) most definitely will. Essentially, the larger amount of school stationery and books that a child needs to carry, the more spacious their backpack should be. However, bear in mind that picking up the largest bag available is also a not a particularly good idea as it could end up being quite difficult for your child to manage. Remember, they will be lugging it around five days per week, so it will have to be both manageable and comfortable. The ideal choice for a school bag is one that has many extra pockets and compartments for carrying many differently sized and shaped supplies such as books, notepads, copies, stationery and even arts and crafts supplies separately. Such a layout will also help your child to stay organised throughout the day, meaning they have significantly less chance of losing anything and therefore having to spend more money on replacements. 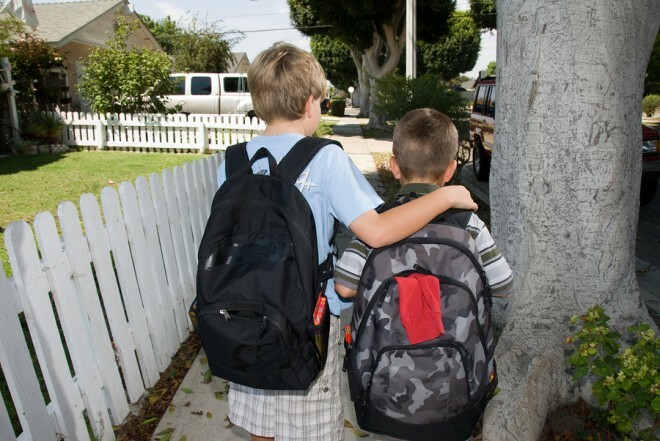 School bags which lack optimum levels of physical support can do a lot of damage to your child’s physical development, particularly in terms of their lower back and shoulder muscles. Look for broad shoulder straps with proper bulky padding. The straps should lie flat on the shoulders and shouldn’t pull the child backwards when carrying weight. The straps should be well stitched and must be strong enough to carry the weight of the bag all by themselves (i.e. your child shouldn’t have to ‘put their back into it’ just to lift it off the ground). Also, some padding on the inner most shelf, the one that will be right next to your child’s back will provide better comfort to your child, stopping the pointy edges of books and stationary from jutting out and into a still developing back. Try and pick a lightweight bag as it is only going to get significantly heavier once you put the various books, stationery and other sundry items into it. When choosing school bags for kids, the durability factor must always be considered. From backpacks to suitcase-style bags, they will all inevitably undergo a lot of rough use including many bumps, drops and collisions on a daily basis. Therefore, they must be strong enough to withstand some hardy use. The stitching is as important as the fabric is in terms of ensuring the durability of the bag. Never buy bags with threads running out of them as they are almost certain to give you trouble after a few weeks of continuous use. When it comes to choosing the fabric, nylon and canvas are believed to be among the toughest materials going. You might also want to consider investing in a water-proof bag lest your child’s books, notebooks and stationery get spoilt in the rain. If you live in an area that is prone to sudden and heavy rainfall, waterproofing is arguably the single most important thing to look for when purchasing a new backpack, as the cost of replacing soggy and crumbled textbooks is no picnic! Even in areas where rainfall is not common or plentiful, Murphy’s Law would dictate that the one time the heavy rain does hit would be the time your child gets caught up in it and has their school gear ruined. Last but by no means least, as with when buying pretty much anything for kids, the colour and design plays a very important role. You should always take into consideration the likes and dislikes of your child. If at all possible, you should bring your kid along when you go shopping for a new school bag. If they play an active role in choosing it, they will feel a better sense of ownership and respect for it, and therefore take better care of it, meaning it will last longer and not need replacing any time soon. Kids typically tend to like bright colours and patterns. No doubt there are specially themed bags depicting their favourite cartoon characters or movies. Just bear in mind though, that you probably shouldn’t pick up a very light coloured bag as it will get dirty-looking a lot quicker and find itself in need of cleaning more often.